Illegal gold mines are flourishing In Lombok Island, Indonesia. While the gold rush is helping local villagers earn a living, in same time the mining operations are having a negative impact on the environment. The gold mining boom on the Indonesian island of Lombok has radically changed the economy of a region from previous job, fishing and farming. However, there are many negative impact for environment and Lombok people. 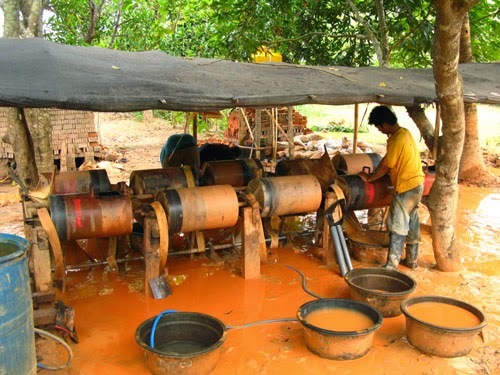 Illegal gold mining use mercury that is illegal in Indonesia, however it is routinely used to extract gold in Lombok. Every year, tens of tons of mercury are released into the environment. This is the most dangerous stage of mining, because mercury can be absorbed into the body. 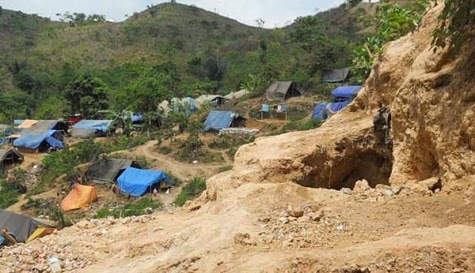 You can see many gold mining in most of the hills in Sekotong province. The hills become overrun with holes and a dense network of tunnels. Small huts covered with blue tarpaulins mark the entrances to the tunnels on this slope near the village of Pelangan. They build a tunnels that just wide enough to allow a man to crawl through. “Sometimes, when we dig our tunnel, we end up inside a friend’s tunnel, so we just come back a little and start digging in another direction,” says one of the gold minner. Saiful. The only light comes from a small headlamp worn by the miners, and temperatures can reach 38 degrees Celsius. The plant is next to a canal that runs into the sea and through a mangrove forest, yet it has neither protection nor barriers to prevent environmental pollution. The water in the island’s cyanidation sites is contaminated with mercury and cyanide, and is highly toxic for wildlife in the area.